Aside from chocolate and beer, it’s often been said that Belgium’s most valuable export is its brains. The sheer level of excellence of the country’s academic institutions and their continued embrace of English as a teaching language has now made Belgium as popular a choice among international students as among locals. But one university stands out because of the headlines it generates: KU Leuven. Founded in 1425 – making it one of the oldest universities in the world – it can always be found towards the top of every international ranking. For the past three years, the prestigious Times Higher Education World University Rankings has placed KU Leuven in its top 50. It currently sits in the top 10 list for Europe, ranking particularly high in the arts and humanities. For the last two years, KU Leuven has been ranked the most innovative university in Europe by Reuters. And number five in the world. It also regularly features in the top 100 of the QS World University Rankings and of the Academic Ranking of World Universities. Most recently, KU Leuven’s Faculty of Economics and Business (FEB) was awarded an EQUIS label for a period of five years. The prestigious EQUIS accreditation is awarded by the European Foundation for Management Development (EFMD) to business departments or business schools as a sign of excellence. KU Leuven’s Faculty of Economics and Business is the only university department in Belgium to have received the five-year EQUIS label, which followed on from the three-year label it received in 2014. The accreditation is awarded after a long process of assessment of every aspect of a business department, including the quality of the programmes, relevance of research, degree of internationalisation and the relationship with the corporate world. The faculty’s popularity is based on a number of aspects, such as its unusually strong interplay between top-notch research and education and its collaboration with the corporate world. The business degree offers ample opportunities for internship with a local company, providing hands-on experience in one of many sectors. The faculty also offers an integrated platform for recruitment and career advancement. This Career Corner gives students a head-start in their careers. KU Leuven also focuses on entrepreneurship through its LCIE Entrepreneurship Academy. Students learn to create a business plan, get advice from successful starts-ups and discover the advantages of starting their own business. FEB, with campuses in Leuven, Antwerp, Brussels and Kortrijk, is home to more than 7,000 students, of which some 1,000 come from abroad. All campuses are part of the same department and, hence, carry the EQUIS accreditation. The faculty offers a bachelor’s programme in Brussels, eight master’s programmes, an advanced master’s programme and two PhD programmes in English. FEB programmes prepare students for successful entrepreneurial endeavours as well as careers in the corporate world, in national and international public policy-making, or in research. Prospective students can get to know the university’s FEB programme at one of several upcoming Open Days. On 24 March, the main campus in Leuven will be open to provide information, presentations and the chance to chat with faculty and students. A second Open Day in Brussels takes place on 21 April, as does one at the Antwerp campus. There are also an Open Days at the campuses in September. Yes, KU Leuven has campuses, buildings and laboratories in other locations, which is one of its strengths. Depending on their programme, students might attend the main campus, dotted around the beautiful, medieval town of Leuven, the capital of the province of Flemish Brabant. Or they might live in the bustling metropolis of Brussels, the capital of Europe. Additional campuses in the historical city of Antwerp and in Kortrijk – surrounded by the lush green of West Flanders – mean that KU Leuven is never far away, no matter where you live in Belgium. 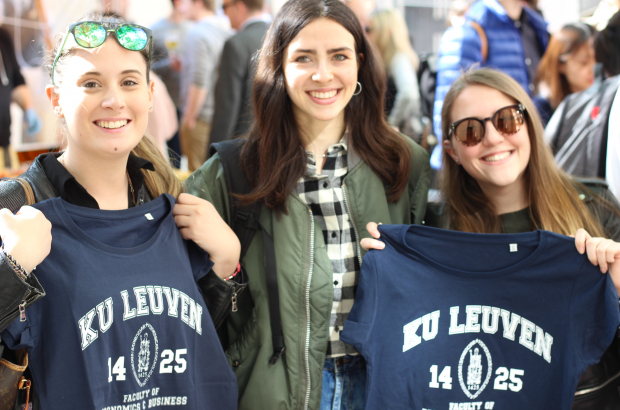 KU Leuven counts more than 10,000 international students on its four campuses, which offer a full 86 undergraduate and graduate programmes in English. From law to economics to bioscience, students looking to earn a Bachelor’s or Master’s degree will find any programme they’re looking for. KU Leuven offers both an Initial Master’s, one or two-year programmes, and an Advanced Master’s, mostly one-year programmes that are highly specialised for those already holding a Master’s degree – whether from Leuven or from somewhere else. But the university is also one of Europe’s most popular for international doctoral studies, with English being the common language in a variety of fields, including humanities, social sciences, hard sciences, engineering and technology. Known for its excellence in research and innovation, KU Leuven spent more than €465 million on research in 2016. With nearly 160 different nationalities studying at KU Leuven, you’re likely to find a compatriot among its numbers. To find out, check in at the International Office. It handles all aspects of life at the university for international students, from registration to housing.